MoveUs, delivers an API toolkit offered as a platform extension, in the form of light full services (REST) which will provide developers and third parties access to these data. 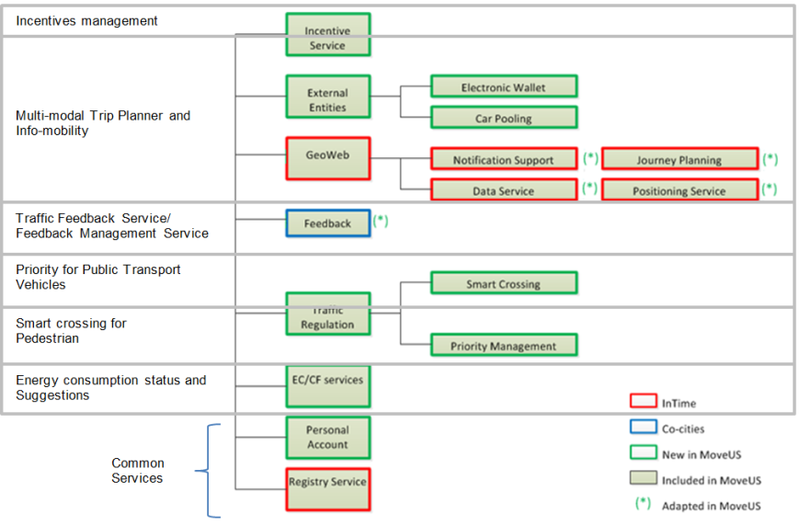 Aligned with the service taxonomy defined in eMotion project, the figure below shows the platform APIs (Application Programming Interfaces); those existing and functionally equivalent service types are highlighted with a red box for In-Time project, a blue box for Co-Cities project and a green box for MoveUs specific services. Asterisk identifies those categories extended on MoveUs. Data /Planning. Geo-located planning and information services: multi-modal multi-objective planning. PoI information (stops, EV charging points, parking, bike sharing). Positioning. Geocoding and user tracking services. Notification Support. Subscription to incidences on frequent and planned routes. Registry. Request for available services and application configuration options. Personal Account. Mobility personal data, general preferences, personal energy consumption data, preferred and frequent trips learning. Incentive. Management of incentives, awards, coupons, advertisement and vouchers. Traffic Regulation. Smart Crossing and Priority Management Services supporting field equipment and pedestrian/buses coordination. Feedback. Crowd-sourced data collection and feedback options. Energy Consumption / Carbon Footprint (EE/CF) Estimation. Route Energy Consumption Estimation. Current/historical Energy Consumption. External Entities Information: external payment systems and car-pooling services. The MoveUs project is a three-year European project led by ATOS which has developed a cloud-based mobility platform with an effective incentive-based model and Energy efficiency assessment tools rewarding the use of sustainable mobility modes. "User", "You": The user of the MoveUs APIs, an individual or a single entity. In the MoveUs API Toolkit you can find these services and their definitions. The services available in the API Toolkit are limited to those for end users (not for administrators or associated with energy, incentives, etc.). To use this other type of services, you must contact the MoveUs Consortium to receive more information and arrange the service for the transfer. The MoveUs API Toolkit will be available for experimental purposes only and will be accessible under reasonable access policies (no abuse, no overload etc.) as explained below. We won’t provide any kind of support or maintenance to the User(s). Comply with all applicable requirements or restrictions imposed on usage of the data by their respective owners. Although the MoveUs APIs can be used to provide you with access to MoveUs user data, neither our provision of the MoveUs APIs to you, nor your use of the MoveUs APIs, override the data owners’ restrictions. In ALL cases, you are solely responsible for making use of MoveUs data in compliance with the MoveUs data owners’ restrictions. Attempt to cloak or conceal your identity or your application’s identity when requesting authorization to use MoveUs APIs. Use MoveUs APIs for any application that constitutes, promotes or is used in connection with spyware, adware, other malicious programs or code. Use MoveUs APIs in any manner or for any purpose that violates any applicable law or regulation, any right of any person, including but not limited to intellectual property rights, rights of privacy, or rights of personality. Use an unreasonable amount of bandwidth. Use MoveUs APIs in a manner that adversely impacts the stability of our servers or adversely impacts the behaviour of other applications using the MoveUs APIs. Copy, reproduce, transmit, publish or distribute in any way the MoveUs APIs or part of them to any third party. Sell, lease, license, loan, distribute or create derivative works from the MoveUs APIs. You as User shall register on the MoveUs API Toolkit before being able to submit / upload / post any contribution onto the MoveUs API Toolkit. The registration procedure includes setting-up of a user account with password. You are responsible for choosing an appropriate password, for keeping it secure, and shall not reveal your password to any third party. You as User represent and warrant providing true, current, complete and accurate Profile Information in order to register with the MoveUs API Toolkit. You as User shall maintain your profile information up-to-date and confidential. You as User agree to notify Tecnalia immediately of any unauthorized use of your account and / or password by using the contact form at the web site. You as User shall not transfer your account to anyone without prior written permission from Tecnalia. We do not represent or warrant that any MoveUs APIs are free of inaccuracies, errors, defects, bugs, or interruptions, or are reliable, accurate, complete, or otherwise valid. Tecnalia makes no warranties that the MoveUs APIs Toolkit may be accessed or used outside of Spain. Access to and / or use of the MoveUs API Toolkit may not be lawful by certain persons and / or certain entities in certain countries. If You access and / or use the MoveUs API Toolkit from outside of Spain, You do so at your own risk and are responsible for compliance with the laws of your country of residence. The MoveUs API Toolkit is provided on an "as is" and "as available" basis without any warranties of any kind. Your use of MoveUs API Toolkit is at your own discretion and risk, and you will be solely responsible for any damage that results from the use of any MoveUs APIs including, but not limited to, any damage to your computer system or loss of data. MoveUs Consortium, to the fullest extent permitted by Applicable law, disclaims all warranties, whether express or implied, including the warranty of merchantability, fitness for particular MoveUs webpage. We shall not, under any circumstances, be liable to you for any direct, indirect, incidental, consequential, special or exemplary, or other damages, including without limitation, losses, loos of profits, arising out of or in connection with (i) use or access of the MoveUs APIs; (ii) the unauthorized access and/or use of your profile information, (iii) the infringement of any third party’s right; and (iv) any other matters relating to the MoveUs API Toolkit, whether based on breach of contract, breach of warranty, tort (including negligence, product liability or otherwise), or any other pecuniary loss. Under no circumstances shall We be liable to you for any amount.